Why so many wardrobe posts? It is finite, you know. Once you have developed a skill, you move on. Ever wish you were twenty-two again? I can admit I don't, most of the time. 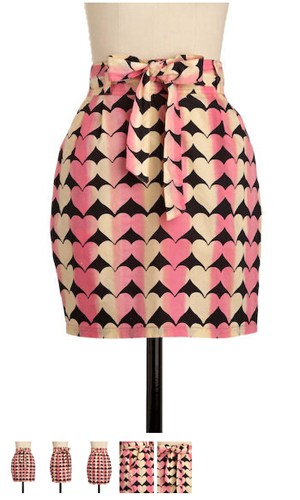 It would be the ideal age for this jaunty heart-printed skirt. But when you're actually twenty-two, you don't have the money to spend on frivolity. 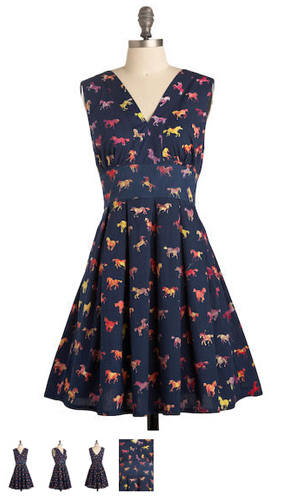 Likewise...this dress is printed with little colored horses. Yup, horses. Way pretty, but again, a tad too youthful for me. I wonder if this thing works? It's touted as the ShamWow of camisoles (sorry, I seem to have ShamWow on my mind lately)--one size fits size 0 to 24. Supposedly it won't creep down, nor will it ride up. But...is it shapewear? Shapewear is 21st-century for "girdle"? Hm. I'd like to find out.